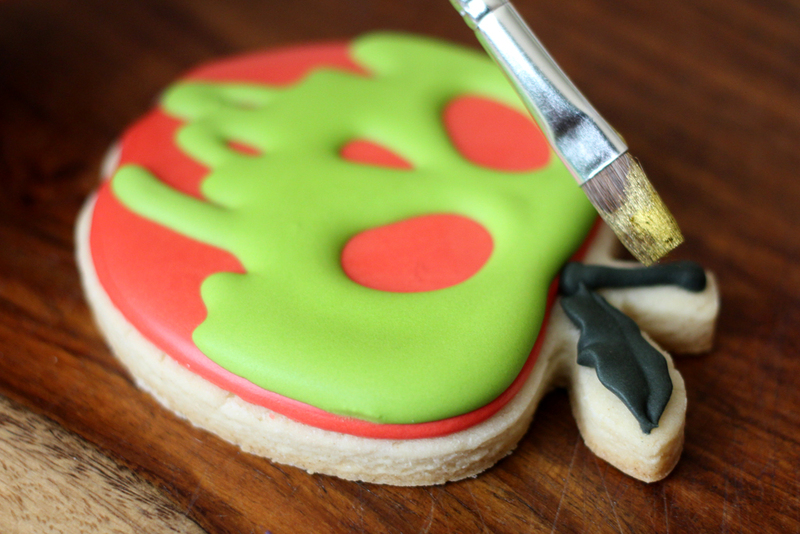 Inspiration for cookie designs can come from just about anywhere. In this case, it came from a lengthy text conversation with my niece, Gloria. 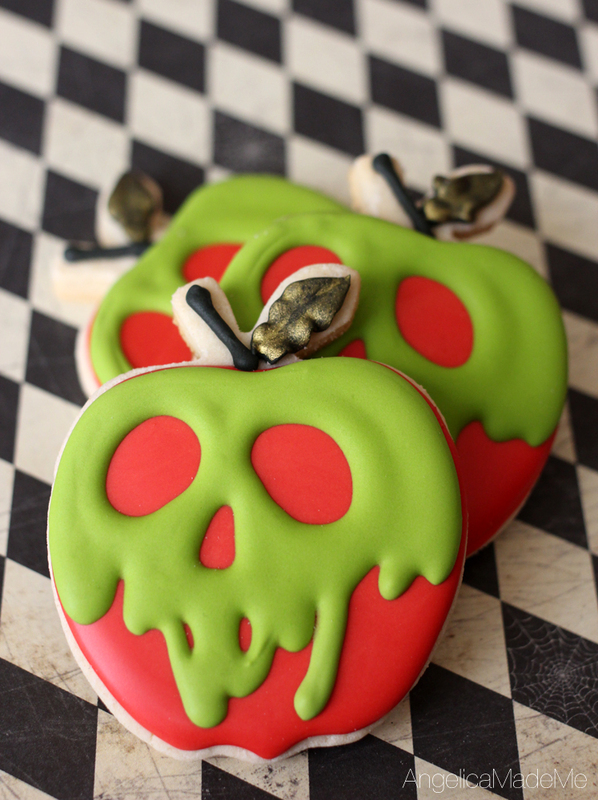 I have no idea how we two adults started texting about Disney and ornaments and villains, but what came out of it was the idea for these Snow White-inspired poison apple sugar cookies. It just so happens I recently acquired an apple-shaped cookie cutter, so these were a must-do. (If you need an apple cookie cutter, you can pick one up here.) 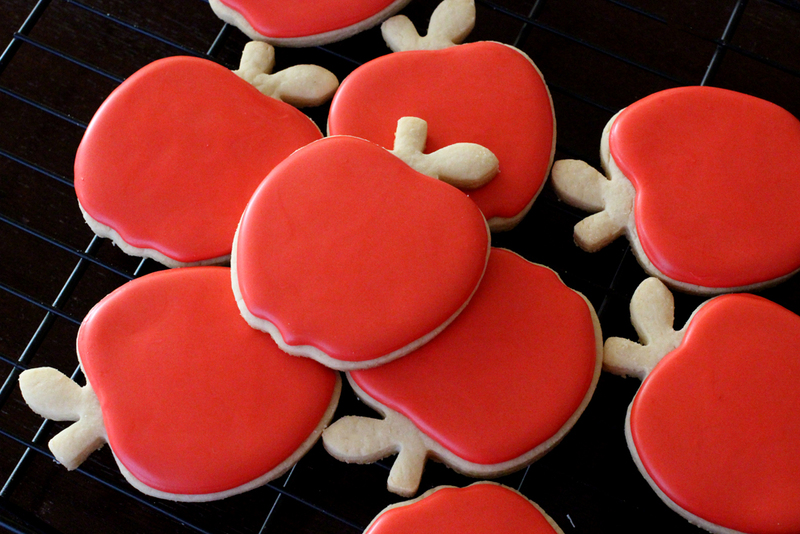 After baking and cooling some cute apple cookies, I iced the apples with red royal icing and let them dry completely. For the poison skull, I enlisted the help of my Kopykake projector. If you don’t have a projector, you can see below that it’s actually not necessary. 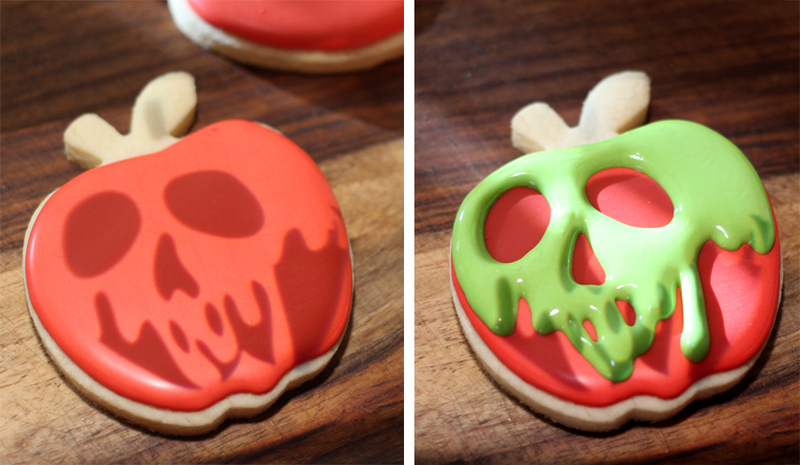 The shape of the poison apple image from the movie didn’t match up to my apple cookie cutter, so aside from the general eye and nose placement, the drippy skull is essentially freehand. It’s helpful to first draw the circles for the eyes, outline the rest of the drips where you want them, and then fill in the skull immediately. The drippy skull is done in all one go – there’s no outline… dry… fill… dry. Just outline and fill it all once. I decided to goth up the apples a bit with a black stem and leaf – it is a poison apple, after all. Once the stem and leaf were completely dry, I added some gold shimmer to leaf to complete the look. The shimmer is simply Americolor’s airbrush sheen in gold. I just dipped a paintbrush directly into the shimmer, painted on the gold, and let dry. Oh my gosh! I love these!! You are SO CLEVER!!! Thank you, Georganne! I just discovered your amazing cookies as well, so your comment gets extra points. These are so cool!!! Where did you get your cookie cutter?? Thanks so much! This particular apple shaped cookie cutter is made by Wilton. What kind of royal icing did you use? Store bought or from scratch. If from scratch, can you give me the recipe? I copied these apples myself and I didn’t have an apple cookie cutter. I used a glass to cut out a round shape and then I used a razor blade to cut away the rest to make the apple. Everything turned out great, except when I made my royal icing, it didn’t smooth out like your cookies did. You can still see the lines from where I filled them in. The recipe I use is 2lbs powdered sugar, 1/4 cup meringue powder, 1 cup water. This recipe can be easily doubled or cut in half. Mix all the ingredients in a mixer and mix for several minutes on medium/high until the icing reaches a stiff (good for outlines) consistency. 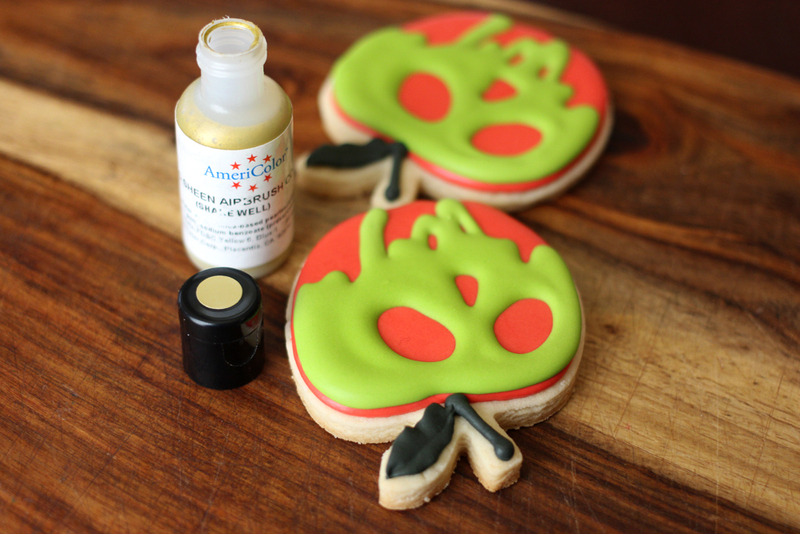 Add water as needed to get a thinner consistency that will smooth out and fill in the cookie. I have swooned over these for a long time and finally made them myself. I absolutely love them and they turned out great except I had one “problem” and I wondered if you could help shed some light… When I piped my green icing on top, I was getting bits of red coming through. My apples had dried overnight. I had traced the eyeholes with a good marker. Could it have been marker ink coming up into my green frosting? I’ve never had it happen before. Thanks for any insight! Hi Ashli – awesome that they turned out in the end! If you used a food marker immediately before the green icing, I supposed the moisture from the food marker could have mixed with the red. So when you added the green frosting, it mixed with slightly wet red icing. It’s also possible the red icing wasn’t totally dry to start with, and that may have caused it. Maybe? Only a guess! Do you add any kind of flavoring to your royal icing? I’ve been adding pure vanilla but I’ve noticed that there really isn’t a flavor left (I use butter/vanilla emulsion in my cookies). So I was wondering if the flavoring is needed at all in the icing or if I should add almond or lemon extract. Also, what affect do to think adding lemon oil would have on the consistency, would the oil cause it to break down? Thanks so much! I just discovered your blog via Craftsy and I love it! Oh my gosh! I JUST saw this, literally months later. I’m so sorry I never replied. Hope you’ve had good luck with extracts if you’ve tried them. I don’t personally use them, but I do use almond and vanilla extract in my cookies, so that adds to the flavor. The key is to never use an oil-based extract in the icing. Always alcohol or water and you’ll be a-ok. I am making these for a Halloween party this year. Can you tell me what colors you used for the this? Was it all Ameripaste? I’m mostly curious about the color green you used. Thanks! These should be perfect for a party! I used Super Red for the apple color and Neon Green for the “poison” drip. All colors are Americolor brand coloring.